"This cake is very moist, and easy to make. All who have tried it thinks it's a hit. It reminds me of a banana cake with a touch of pineapple and cinnamon. Serves 24." Grease and flour a 9 or 10 inch bundt pan. Preheat oven to 350 degrees F (175 degrees C). Mix together oil, sugar, eggs, pineapples, bananas, pecans, flour, vanilla, soda, cinnamon, and salt. 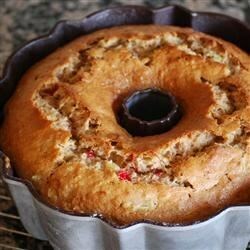 (Optional: adding I cup maraschino cherries to mixture makes a nice fruit cake.) Pour into prepared bundt pan. Bake for about 1 1/2 hours at 350 degrees F (175 degrees C). Deliciously fluffy and moist cake full of fruit! My husband loved this cake. I reduced the sugar to 2 cps. and cut the oil down to 3/4 cp., and the recipe turned out fine. I only had to bake it 70 min.